Paddington Antique Centre Blog: Steampunk comes to PAC foyer! Steampunk comes to PAC foyer! As an established sub-genre of science fiction, "Steampunk"is inspired by 19th Century Western society and its undeniable passion for steam powered machinery. The Steampunk movement and subsequent style incorporates the most romanticized aspects of the American Wild West and a fanciful vision of a post-apocalyptic future. The result is a dramatic and theatrical aesthetic influencing the realms of fashion, culture, architecture and all facets of visual art. Combine Victorian corsets and petticoats with the gadgetry of Jules Verne and HG Wells and you have the beginnings of Steampunk. Add to this vision a pair of goggles, a top hat or a leather holster and you have a sense of this exciting and individual vintage-inspired philosophy. For a further glimpse into the Steampunk world, watch the 1965 TV series The Wild Wild West or the Will Smith movie of the same name. Or read the 1999 comic book series The League of Extraordinary Gentleman or the film adaptation of 2003. There are many devoted exponents of the Steampunk genre in modern art, literature and music. Even with artists not exclusively deemed Steampunk, homage is often given to its obvious attraction. Recently for example, the music video of “Turn me on” by David Guetta and featuring Nicki Minaj takes place in a Steampunk universe where Guetta creates human droids. Even if you are not really a devotee of the clothing style, Steampunk is a stimulating and playful way to dress up your environment. 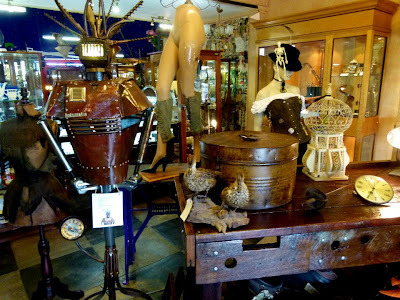 Whether you create a whole room with a suggestion of a Sherlockian neo-Victorian library or just arrange fascinating vignettes of taxidermy, scientific instruments and widgets, be inspired and transported by Steampunk. You can hear the whistle blowing! All aboard the Steampunk train! !